If there’s one comment guaranteed to provoke a reaction in my classroom, it’s my suggestion that the arrival of the washing machine had a greater impact on the lives of women than the vote. It’s a remark that is usually met with shocked looks. I’m not downplaying the importance of the vote, but, as I explain to students, for the ‘ordinary’ woman, any technological advancements that made her day-to-day life easier was of far greater relevance than the more abstract idea of the vote. This was really brought home to them when I played an extract from an interview that I did with my mum about her memories of my grandmother’s domestic routine. My mum recalled how, as was the case for most Irishwomen, Monday was wash day. My grandmother would begin hand washing as my mum and her brothers and sisters were leaving for school in the morning, and she was still washing when they returned in the late afternoon. The arrival of a washing machine into the house made a huge difference to her life, significantly freeing up her time on Mondays. I’m in Dublin at the moment for a few days, and have been at the National Library of Ireland reading issues of Woman’s Way from the 1960s as part of the research for my women in the media project. The magazine is filled with advertisements for new technology — like the washing machine — promising to improve the lives of women. The most common was an ad from the ESB (Electricity Supply Board) asking, ‘Have you got your fridge yet?’ One of the benefits, according to the advertisement, was the ability to ‘cut down your shopping time to one day a week’. 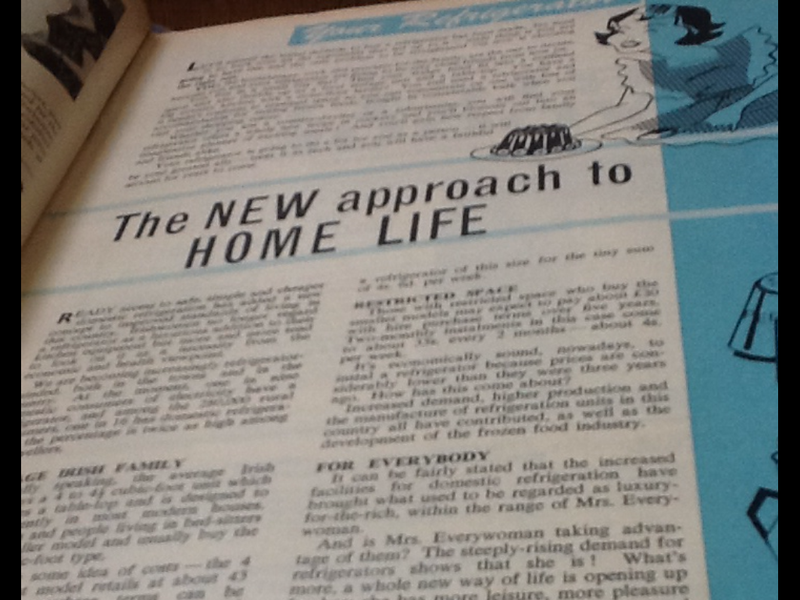 On 15 June 1963, Woman’s Way carried a major feature on the refrigerator, which was noted to have become a ‘necessity from the economic and health viewpoint’ rather than a ‘luxurious addition’ to the kitchen. Over several pages, readers were shown how the housewife and her new fridge were ‘going to be very close friends’. The feature included ‘dos and don’ts’ tips on using the refrigerator, a recipe page entitled ‘Cooking with a refrigerator in the background’ and a spread on the different types of fridges available, depending on the size of one’s kitchen. You can work out a whole new working-plan whereby your leisure will be increased. Complete meals may be prepared and stored for a day or two when you have a refrigerator to keep them fresh. It could even happen that the refrigerator will give you a little longer in bed in the morning! Some people prepare breakfast the night before and leave it ready for the actual cooking next day. The same clever housewives prepare the evening meal in the morning and leave themselves a free day until the actual cooking period starts, they prepare a whole day’s supply of baby food in the morning, too. It is hardly surprising that this multi-page feature appeared at a time when refrigerators were becoming more affordable — taking them out of the ‘luxury item’ bracket — and were increasing in popularity. Not only did they keep produce fresh and perishable items lasted longer than they would at room temperature, but their popularity can also be explained because of the contribution they made to day-to-day lives of housewives. Next Next post: What Makes a Good Wife? The 60’s were quite a time in the UK- peasant culture was experiencing its death rattle, (Blythe has a great description of its death in Akenfield) tech was more affordable, and the service field had basically imploded. Whereas 75 years earlier even a middle class house frau could have afforded a maid of all work, the wars and social progress had simply done away with the wretchedly poor who would take such positions for such wages. I like your bit about washing machines. They also freed women from the very real threat of losing children to scalding. Of course, Tuesday was still drying day and Wednesday ironing, but at least a girl could keep a manicure intact, eh? 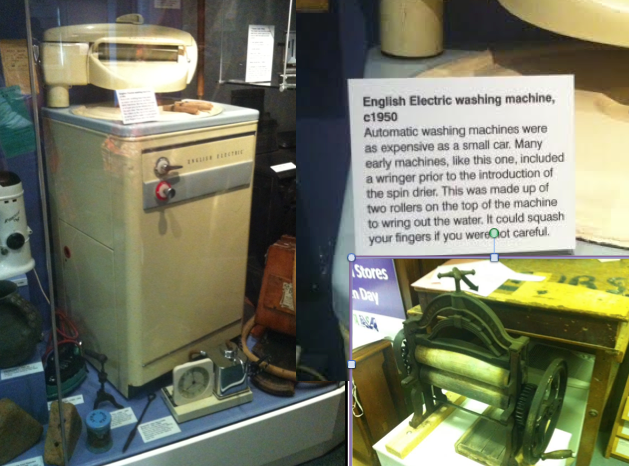 Excellent post and a valid point, my mother always says how the arrival of a washing machine in her family home in Tipperary amazed her mother. Considering the work involved in washing 8 children and a husbands clothes it must’ve turned her world upside down! Was speaking to my father yesterday about the arrival of electricity in Allenwood in Co. Kildare when he was a child in the 50’s and how his mother wrote countless letters to the esb requesting their little old bog road community to not be overlooked. The local community used to get her to write all the ‘official’ letters due to the poor level of literacy in the area at the time, crazy to think that was only 60 years ago. Thanks, Ed. Good point about the arrival of electricity too: made a huge difference, especially in rural areas. I enjoyed reading this. Thank you. Can I make one observation that indirectly relates to your post and to the first comment on the post about washing machines eliminating the risk of scalding? I too remember my mother talking about how the washing machine eased the daily grind of life, but she paid a harsh price. My youngest sister drowned in a top-loading washing machine. I’m not saying it was a common occurrence, but I have heard of similar cases. New technology brought with new sets of dangers into homes. Hi Breda, thanks for stopping by. Interesting that you should mention the dangers of the washing machine. Buried across from my grandparents’ grave is a toddler who, in the early 1970s I think, also died from drowning after falling into the washing machine.